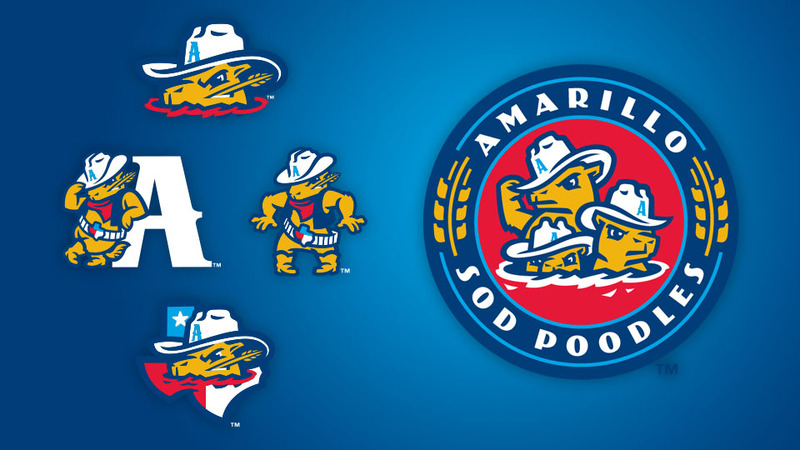 Amarillo's new Double-A Texas League team will be known as the Sod Poodles, a slang term for a prairie dog. In 2019, the Amarillo Sod Poodles will be standing on mounds and roaming the fields. The Sod Poodles' name and logo were unveiled Tuesday afternoon, ending months of speculation regarding the identity of Amarillo's new Minor League team. The Sod Poodles will be the Double-A affiliate of the San Diego Padres, formerly the San Antonio Missions in the Texas League. The new team will play at a ballpark currently under construction in downtown Amarillo. Per the team, Sod Poodles is a "pioneer's nickname for 'Prairie Dogs.'" This moniker emerged victorious in a "Name the Team" contest, triumphing over a quartet of other selections rooted in Amarillo's Texas Panhandle location: Boot Scooters, Bronc Busters, Jerky and Long Haulers. "We wanted something different, something authentic to Amarillo that's never been done before," said Tony Ensor, Sod Poodles president and general manager. "Early on, we looked over a lot of different areas, and we were really focused on the beef industry. ... But obviously prairie dogs are prevalent in West Texas, and once we discovered the uniqueness of the Sod Poodle, the minute that name came out, everyone's eyebrows were raised. There was just something special to it from the very beginning." Ensor said research into the Amarillo market revealed the locals to be "genuine, open, friendly and having a pioneer spirit." "Everything's about family in Amarillo and that's what Minor League Baseball is all about," he continued. "So doing research into sod poodles, there are a lot of similarities. In the life of a sod poodle, family is the most important and protection of that family. That pioneer spirit and never getting beaten down, that underdog character that withstands everything. That said a lot about the people of Amarillo. ... The ability to take on the world and come out on top." Sod Poodles was the choice of the front office and also finished first in the fan vote. This was no surprise. In the four-and-a-half months since the "Sod Poodles" name was announced as a possibility, it's become something of a grassroots phenomenon in Amarillo. Perhaps most notably, Sod Poodles have been the subject of two original songs: Carson Leverett's "Sod Poodles Anthem" and Ed Montana's "What is a Sod Poodle?" According to Ensor, these tuneful tongue-in-cheek tributes represent just the tip of the dirt pile. "We had [our local] Chick-fil-A putting up on their marquee 'Chicken tastes better than sod poodle,'" he said. "You'd go in and around town, and there were stores selling sod poodle cookies and popsicles and three or four different brands of T-shirts. A lawyer in town made it part of his marketing campaign ... and there's a church on Polk Street that made 'Sod Poodles and Mind Boggles' the topic of a sermon. Everywhere you turn, people were embracing it -- it created its own energy. The community created this buzz, so even aside from the fan vote, we got the sense that this was the direction everyone wanted to go." The Sod Poodles' identity was crafted in conjunction with Brandiose, a San Diego-based design company whose work is prevalent throughout the Minor League landscape. Ensor said once Sod Poodles was decided upon as the team name, it was imperative that the logo "have some Western grit to it. A John Wayne Sod Poodle attitude." "[The Sod Poodle's cowboy] hat is very Texas, and we have the state colors of Texas within elements in the logo itself," he said. "And [the Sod Poodle's] yellow, and 'amarillo' means 'yellow' in Spanish. You throw in the grass seed poking out of his mouth, that stands for the sod. Also, with the lighter, retro blue, Route 66 was part of the inspiration. Route 66 runs through the heart of Amarillo." The unveiling of the name and logo marked a significant offseason benchmark for Amarillo. Future milestones scheduled to occur prior to Opening Day include a uniform unveiling, the announcement of the ballpark name and the mascot reveal. "It's been an amazing journey, one that the community has been with us on all along," said Ensor. "What has made this such a fun ride is that everyone is pulling the wagon in the same direction."